The RV lifestyle allows travelers to experience an incredible sense of freedom, boasting qualities such as the ability to drive to amazing places, pursue a minimal lifestyle, and go on daily adventures. However, a home-on-wheels offers a balance of happy moments and some unpleasant ones, like dealing with your RV plumbing! Luckily, as long as you stay informed and make an effort to upkeep of your RV’s plumbing system, you can ensure a failure-free experience and a nice smelling RV. 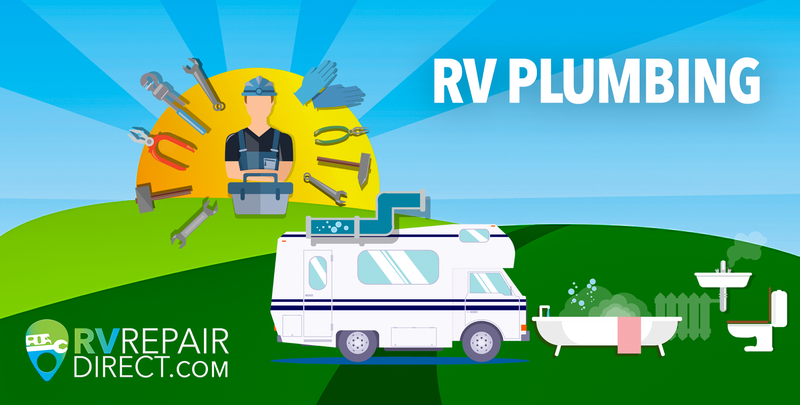 The majority of RVs operate with three tanks for the plumbing system. You have the fresh water tank, gray water tank, and black water tank. Each tank serves a different purpose and requires specific attention. The name speaks for itself, as your black water tank will store toilet water and waste, and is required to be dumped at a dump station. This tank stores kitchen and bathwater, and must also be emptied at a dump station. Your fresh water tank provides clean water for your RV’s sinks, shower, and toilet. Some RVers also use this water as drinking water. This does not require dumping, but does call for proper sanitation. When deciding to dump your holding tanks, the first thing you must make sure of is that the tanks are at least two thirds full. If you must dump your tanks when they are not full, always fill the with water until you reach at least two thirds capacity. If your rig has multiple drain valves, always start with the black tank. As you can imagine, this is not the cleanest task in the world, so make a great effort of protecting yourself from bacteria. Having disposable gloves, disinfectant, and hand sanitizer at arm’s length is key. Once you are protected against the elements, it’s time to clean out those tanks! First, access your sewer hose and thoroughly attach it to the dump station hole. Ensure that it is in deep enough and secure with no chance of popping out. Proceed by attaching the sewer hose to the tank drain hole and once secured you can open the valve to the black water tank. When the dumping process has ended, you’ll want to rinse out the now empty tank. A common cleaning process is to hook up a normal garden hose to the water source at the station and insert at the toilet. Begin to pour in water and once the tank has reached the two-thirds mark, dump once more. Use these same instructions for emptying your gray water holding tank. Once complete, confirm that all water tank valves are closed, then detach the sewer hose from your RV tank outlet. It is recommended to rinse out the sewer hose with water before disconnecting from dump hole. Special note: don’t forget to close up the RV drain cap! Finish the process by adding a minimum of two gallons of water to your black tank and the appropriate amount of RV tank chemical to keep the system in good health, and repeat in the gray tank if you choose to do so. Having a clean fresh water tank is crucial to keeping out any unwanted bacteria or foul smells. Even if you don’t drink from this source it is important to sanitize your fresh water tank before each camping season, especially if the RV has been sitting in storage. The most common practice of sanitizing is to use a bleach solution with water, typically being one cup of bleach per 10 gallons of water that the tank can hold. Pour in bleach after 10 gallons of water has been dispensed. Follow up bleach with more water, filling up all the way, and turn on the water pump, faucets, and shower until you notice a bleach smell. Leave the solution in your fresh water tank overnight and drain the system the following day. Complete your sanitation process by running fresh water through until the bleach smell is gone. For more specific steps read this detailed blog on water sanitation. We hope you enjoyed our crash course to RV holding tanks! Utilize these tips for a clean and enjoyable RV experience. This very helpful to new rv. Please read and try every thing that has been discussed.